What does it take to create a brand-new theater company? For Fairfield Center Stage, the new nonprofit theater company in Fairfield, Connecticut, it takes resilience, creative thinking, a strong sense of community, and a little bit of luck. 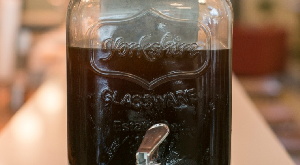 No muss, no fuss cold brew coffee done quick and easy -- and right on your countertop! The ups and downs of show business are on full display with Westport Country Playhouse's hit production. An interview with Stuart Kells and Ian D. Gow, authors of 'The Big Four.' What's next for these powerful institutions could have tremendous ripples in the way we do business.